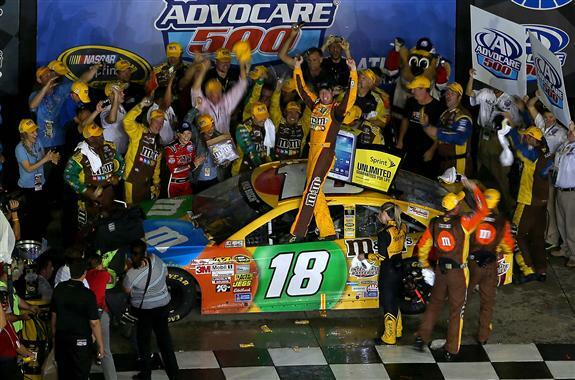 HAMPTON, Ga.–Kyle Busch proved emphatically Sunday night that he knows what to do with a lead when he gets it. By the time he grabbed the top spot at Atlanta Motor Speedway for the first time, however, the Chase for the NASCAR Sprint Cup picture had changed dramatically. Busch claimed the trophy for the AdvoCare 500, beating Joey Logano to the finish line by .740 seconds. Locked into a top-10 spot in the Chase for the NASCAR Sprint Cup, Busch added three bonus points to his Chase-opening total with his fourth win of the season. The win was Busch’s second at Atlanta and the 28th of his prolific career, tying him with Rex White for 23rd on the career victory list. And he did it in a car he labeled “a joke” early in the race. For other Chase contenders, Sunday night’s race was a mixture of perseverance and perverse fortune. Beyond that, for reigning Cup champion Brad Keselowski, it was an unmitigated disaster. Logano’s strong second-place finish gained the driver of the No. 22 Penske Racing Ford two spots to eighth in the standings and gave him a 16-point cushion over 11th-place Jeff Gordon with only next Saturday’s Richmond race remaining before the Chase field is set. Driving with a broken wrist, Martin Truex Jr. ran third, but his hold on a wild card berth in the Chase remains tenuous. With two-time winner Kasey Kahne holding the first wild card spot, Truex has a five-point lead over Ryan Newman, who came home fifth Sunday, for the second berth. Kurt Busch surged back into the top 10–and hence a provisional Chase spot–with a fourth-place result, but Busch leads Jeff Gordon (sixth Sunday), a fellow non-winner this year, by a mere six points. Dale Earnhardt Jr. gave himself some breathing room with an eighth-place finish. He remains seventh in the standings, 37 points ahead of Gordon in 11th. A finish of 32nd or better at Richmond will lock Earnhardt into the Chase, whether he leads a lap or not. Engine issues that ended in a catastrophic failure relegated Keselowski to a 35th-place finish, putting him in dire peril of becoming the second defending champion to miss the Chase (Tony Stewart was the first in 2006). Keselowski fell to 15th in the standings, 28 points behind Kurt Busch in 10th. Not even a victory at Richmond will guarantee Keselowski a berth in NASCAR’s 10-race playoff. Logano, off sequence on pit stops, swapped the lead with Clint Bowyer during a 112-lap green-flag run that encompassed two full pit cycles surrounding the midpoint of the race. By Lap 190, Bowyer had opened a 7.093-second lead over the Logano’s No. 22 Ford, but Bowyer’s experimental Toyota Racing Development engine erupted two laps later, wiping out the advantage and knocking the No. 15 Camry out of the race. Six laps after the ensuing restart on lap 199, Denny Hamlin spun in Turn 4, thanks to a bump from Paul Menard. All lead-lap drivers came to pit road for tires and fuel except for Edwards and Logano. After a restart on Lap 213, Keselowski grabbed the lead. Edwards dropped back precipitously, but Logano held his own in second place until Keselowski’s engine began to lose power on Lap 243, handing the top spot back to Logano, who held a five-second lead over Newman after a round of green-flag pit stops that ended on Lap 254. Newman cut the margin to 2.3 seconds before Jimmie Johnson spun off Turn 4 trying to avoid Jeff Burton’s Chevrolet, which had slowed to enter pit road, to cause the seventh caution and bunch the field for a restart on Lap 293. First off pit road after the decisive stop, Kyle Busch led the field to green, and on the restart lap, brother Kurt Busch streaked around the outside to move from 11th to second by the time the cars hit the middle of the backstretch. Before the leader could get to the start/finish line, however, Brian Vickers’ spin in Turn 4 slowed the field for the eighth time, setting up a restart on Lap 298. After one more caution, for a wreck involving Burton and Austin Dillon in Turn 4, Busch maintained control of the race to the finish. Notes: Six drivers–Johnson, Bowyer, Kevin Harvick, Edwards, Kyle Busch and Matt Kenseth have clinched top-10 spots in the Chase… Despite a 36th-place finish Sunday, the result of a broken radiator and oil cooler after contact with teammate Johnson on an early restart, Kahne clinched at least a wild card berth on the strength of is two wins this year. 1. (9) Kyle Busch, Toyota, 325, $338058. 2. (11) Joey Logano, Ford, 325, $250073. 3. (7) Martin Truex Jr., Toyota, 325, $201865. 4. (32) Kurt Busch, Chevrolet, 325, $165235. 5. (17) Ryan Newman, Chevrolet, 325, $167848. 6. (5) Jeff Gordon, Chevrolet, 325, $171176. 7. (3) Juan Pablo Montoya, Chevrolet, 325, $156504. 8. (8) Dale Earnhardt Jr., Chevrolet, 325, $129265. 9. (30) Kevin Harvick, Chevrolet, 325, $156526. 10. (22) Brian Vickers(i), Toyota, 325, $120015. 11. (15) Jamie McMurray, Chevrolet, 325, $136675. 12. (6) Matt Kenseth, Toyota, 325, $144946. 13. (20) Marcos Ambrose, Ford, 325, $135419. 14. (13) AJ Allmendinger, Toyota, 325, $133363. 15. (24) Greg Biffle, Ford, 325, $122355. 16. (1) Ricky Stenhouse Jr. #, Ford, 325, $163466. 17. (31) David Gilliland, Ford, 325, $120738. 18. (2) Carl Edwards, Ford, 324, $139255. 19. (26) Austin Dillon(i), Chevrolet, 324, $117013. 20. (29) Aric Almirola, Ford, 323, $140091. 21. (21) Danica Patrick #, Chevrolet, 323, $101155. 22. (19) Casey Mears, Ford, 323, $119888. 23. (14) David Ragan, Ford, 323, $117002. 24. (16) Paul Menard, Chevrolet, 322, $128721. 25. (27) Mark Martin, Chevrolet, 322, $142405. 26. (36) Dave Blaney, Chevrolet, 322, $96930. 27. (37) Travis Kvapil, Toyota, 322, $101830. 28. (10) Jimmie Johnson, Chevrolet, 321, $142141. 29. (25) David Stremme, Toyota, 321, $93030. 30. (42) JJ Yeley, Chevrolet, 321, $94380. 31. (41) Timmy Hill #, Ford, 321, $92730. 32. (34) David Reutimann, Toyota, 320, $92555. 33. (38) Mike Bliss(i), Chevrolet, 319, $100380. 34. (28) Jeff Burton, Chevrolet, 319, $100230. 35. (23) Brad Keselowski, Ford, Engine, 307, $145496. 36. (18) Kasey Kahne, Chevrolet, 292, $109930. 37. (39) Landon Cassill(i), Chevrolet, Engine, 249, $91760. 38. (4) Denny Hamlin, Toyota, Engine, 231, $105960. 39. (12) Clint Bowyer, Toyota, Engine, 192, $124793. 40. (40) Joe Nemechek(i), Toyota, Vibration, 114, $78160. 41. (33) Josh Wise(i), Ford, Vibration, 94, $74160. 42. (43) Michael McDowell, Ford, Vibration, 92, $70160. 43. (35) Scott Speed, Ford, Vibration, 22, $66660. Average Speed of Race Winner: 135.128 mph. Time of Race: 3 Hrs, 42 Mins, 14 Secs. Margin of Victory: 0.740 Seconds. Lead Changes: 28 among 13 drivers. Lap Leaders: 0; J. Montoya 1-24; J. Logano 25-26; D. Ragan 27; M. McDowell 28; J. Montoya 29-39; C. Edwards 40-58; J. Yeley 59-60; C. Mears 61; J. Gordon 62-77; J. Montoya 78; L. Cassill(i) 79; C. Edwards 80-121; R. Newman 122-123; J. Logano 124-138; C. Bowyer 139-166; J. Logano 167-172; C. Bowyer 173-192; J. Logano 193-195; C. Edwards 196-200; J. Gordon 201; C. Edwards 202-203; J. Logano 204-212; B. Keselowski 213-243; J. Logano 244-251; R. Newman 252; J. Montoya 253-254; J. Logano 255-289; Kyle Busch 290-325. Leaders Summary (Driver, Times Lead, Laps Led): J. Logano 7 times for 78 laps; C. Edwards 4 times for 68 laps; C. Bowyer 2 times for 48 laps; J. Montoya 4 times for 38 laps; Kyle Busch 1 time for 36 laps; B. Keselowski 1 time for 31 laps; J. Gordon 2 times for 17 laps; R. Newman 2 times for 3 laps; J. Yeley 1 time for 2 laps; C. Mears 1 time for 1 lap; L. Cassill(i) 1 time for 1 lap; D. Ragan 1 time for 1 lap; M. McDowell 1 time for 1 lap. Top 12 in Points: J. Johnson – 837; C. Bowyer – 809; K. Harvick – 795; C. Edwards – 795; Kyle Busch – 786; M. Kenseth – 768; D. Earnhardt Jr. – 750; J. Logano – 729; G. Biffle – 727; Kurt Busch – 719; J. Gordon – 713; K. Kahne – 709.